NASA's Aqua satellite provided an infrared look at the newly formed Tropical Depression 16W in the Philippine Sea. 16W is known locally in the Philippines as "Jolina." In the Philippines, public storm warning signal #1 was placed in effect for the Luzon provinces of Southern Cagayan, Isabela, and Northern Aurora. 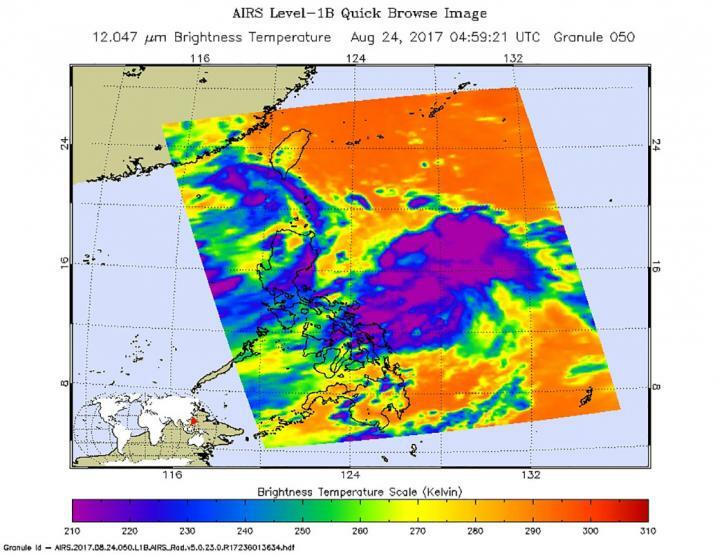 The Atmospheric Infrared Sounder or AIRS instrument aboard NASA's Aqua satellite looked at cloud top temperatures in Tropical Depression 16W using infrared light. The AIRS data were taken on August 24 at 12:59 a.m. EDT (0459 UTC). The image showed some very cold cloud top temperatures as cold as minus 63 degrees Fahrenheit (minus 53 degrees Celsius). NASA research has shown that storms with cloud tops that cold are high up in the troposphere and can generate heavy rainfall. Tropical Depression 16W formed around 11 a.m. EDT (1500 UTC) on Aug. 24. It was centered near 15.6 degrees north latitude and 126.1 degrees east longitude, about 301 nautical miles east-northeast of Manila, Philippines. 16W was moving to the west at 14 knots and had maximum sustained winds near 30 knots (34.5 mph/55.5 kph). The system is forecast to intensify to into a tropical storm with maximum sustained winds near 50 knots (57 mph/92 kph) before passing over Luzon, northern Philippines. Tropical Depression 16W is expected to re-strengthen to 65 knots (75 mph/120 kph) and reach typhoon status in the South China Sea before making final landfall near Hong Kong.